Enjoy a wide range of water sports in an exceptional and unique setting. As a true professional of the sea Cap Ferrat Watersports guarantees you a tailor-made event! 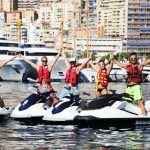 Federate your team to a seminar, strengthen your ties with your customers, share a unique moment with friends, with more than 15 years of experience, we are the provider of your nautical events with a unique structure for large group! Possibility of ticketing for works councils.